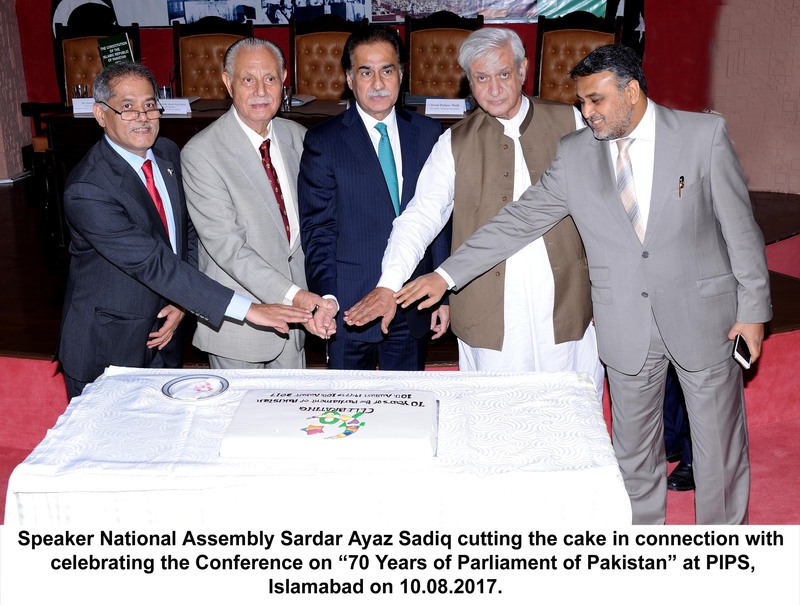 ISLAMABAD:August 10, 2017: To commemorate the celebrations of 70 years of the Parliament, a two day conference was inaugurated at Pakistan Institute for Parliamentary Services (PIPS). Enlightening and insightful reflection upon the history of Parliament was shared by the key note speakers of the session. Honourable Speaker of the National Assembly of Pakistan Sardar Ayaz Sadiq, Former Speakers Syed Fakhar Imam and Gohar Ayub were the Guests of the Honour. Executive Director Pakistan Institute for Parliamentary Services Zafarullah Khan shared his welcome remarks in which he thoroughly reflected upon the historic moments of Parliament and appreciated the initiatives & efforts taken by former & current speakers of National Assembly of Pakistan. Around 120 parliamentary experts from National Assembly, Senate and members of civil society and students participated in the event. Former Speaker National Assembly of Pakistan Syed Fakhar Imam shed light on the constitutional and political history of Pakistan. While sharing his insight he stressed upon the need of reforms in institutions & democratization of system. He also shared his famous ruling against martial law and a 300 years old precedent in UK House of Commons which applied right of governance lies with the elected Parliament. Former Speaker National Assembly of Pakistan Mr. Gohar Ayub Khan underlined the historical background of first Constituent Assembly highlighting the principle of will of the people being the citadel of nations’ aspirations. He also narrated his role as Speaker of the National Assembly of Pakistan. Speaker National Assembly of Pakistan Sardar Ayaz Sadiq in his address thanked the former speakers for their valuable time in celebrating the 70 year long journey of Parliament of Pakistan. He deliberated the hurdles and challenges a speaker has to face during his time as the custodian of house. Sardar Ayaz Sadiq stressed upon the need of arranging such sessions where former National Assembly Speakers can come & share their respective experiences while adding to the history of Parliament. “The performance of committees has improved over time but yet a lot needs to be done” said Sardar Ayaz Sadiq. He also shared his initiative for introduction of parliamentary studies in 17 universities to promote education of the ideals of the Quaid e Azam Muhammad Ali Jinnah. The first day of event concluded with cake cutting ceremony by the Speaker National Assembly Ayaz Sadiq, Former Speaker National Assembly Syed Fakhar Imam and Mr. Gohar Ayub Khan. PIPS Director Research and IT was the moderator who presented the vote of thanks. The two day Dialogue on Parliament@70 will conclude afternoon with a lecture by Hon Senator Mian Raza Rabbani, Chairman Senate on “Challenges of protecting the will of the people.” Pakistan Institute for Parliamentary Services is oraganing the first ever anniversary of the Parliament to commemorate the first Constituent Assembly of Pakistan session on 10th August, 1947.